Lately, like most of the time the last years, there is a strong police presence in the area of Friedrichshain and an extensive use of the police helicopter. 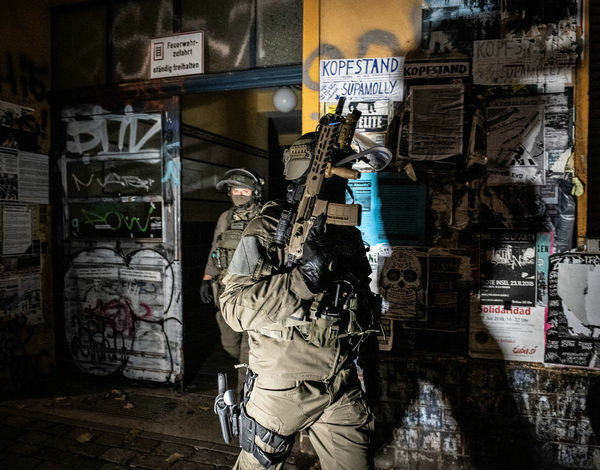 It looks like the strategists in the repressive administration of Berlin try to force us into a defensive sitiuation by confronting in the same time the Rigaer94 and the anarcha-feminist house-project Liebig34, that will lose its contracts in the beginning of the next year. There are high expectations for a strong resistance to defend Liebig 34 but with the threats against Rigaer94, which is just three houses away, we who are living and/or fighting in the „Dangerzone“ of Friedrichshain, need your help. << Amsterdam: No eviction for hotels! The squatting collective ‘De Mobiele Eenheid’ stays!